Nestor Nestor Diculescu Kingston Petersen announces the official formation of the “Center for Excellency in Fiscal Disputes” (in Romanian NNDKP CELF), an NNDKP initiative that is the reflection of the intensive professional and scientific collaboration of over 10 years between the company’s dispute resolution and tax advisory teams. The experience gained over time in assisting clients in over 300 fiscal disputes resulted organically in the consolidation of the professional skills and tightening of the cooperation between the firm’s lawyers and tax consultants, thus turning a concept into a “Center of Excellency”. NNDKP CELF will provide integrated services to the company’s clients from the initial stage of a fiscal dispute until the litigation stage before the Romanian courts by combining the experience, technical skills and perspective of the tax consultants and lawyers specialized in tax disputes. 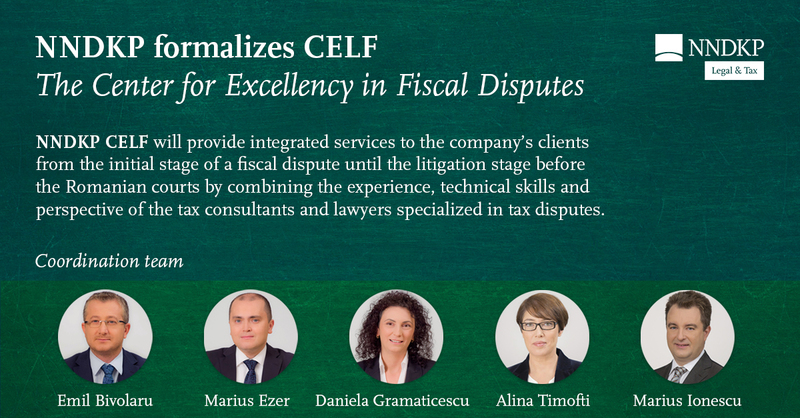 The activity of CELF is organised so as to ensure that clients benefit from the first moment from complete professional services covering both a technical perspective and the perspective offered by a potential tax dispute, an approach possible only due to the involvement ab initio of a team of mixed professionals in each project. “Through NNDKP CELF, we set out to also act as a think-tank, by relying on the technical-practical experience of the CELF members as well as that of our clients. Together we intend to propose ideas for improving the relationship between the taxpayer and the tax authority, to increase the degree of predictability for the taxpayers involved in tax disputes, to promote mediation measures intended to decrease the number of tax disputes, and new solutions to prevent lengthy and difficult tax dispute and certainly, in case of need, to building step-by-step the arguments necessary to win the tax disputes”, specifies Emil Bivolaru, Partner in the NNDKP Dispute Resolution practice. BEPS is the acronym for Base erosion and profit shifting relating to the measures against base erosion and profit shifting.